Lung disorders can cause symptoms that include coughing, wheezing, shortness of breath, and chest pain and tightness. The Merck Manuals Online Medical Library notes that some of the symptoms due to lung problems, such as chest pressure, pain and tightness, may also be mistaken for symptoms of a heart attack, blood vessel disorder or gastrointestinal disorders. Chest pain due to lung disorders may also be accompanied by coughing up blood or a bluish discoloring of the lips and skin. Lung conditions that cause chest pain may be transient or chronic and experienced as localized or general pain. A cough functions to clear the lungs and airways of foreign or irritating substances and protect the lungs, as noted by Merck. A cough may clear mucus containing phlegm or inhaled particles from the lungs. However, when the lungs are inflamed, the cough reflexes are triggered, causing a chronic cough. Severe and chronic coughing can strain the muscles of the chest, causing pain and soreness. Chest pain is commonly caused by pneumonia, which can inflame the lungs as well as the pleura or membranes that encompass the lungs, leading to severe chest pain and tenderness, particularly on deep inhalation. A pneumonia infection of the pleura is called pleurisy and is marked by severe chest pain on inhaling and cessation of pain on exhaling, according to the Mayo Clinic. Pneumonia is usually treated with antibiotics or antiviral and anti-inflammatory medications. A pneumothorax is a condition in which air enters the pleural cavity around the lungs and causes the complete or partial collapse of a lung, which results in severe difficulty breathing and pain and pressure in the chest, as noted by the Mayo Clinic. This condition can be caused by trauma or an injury to the chest, such as a blow with a blunt object or a deep chest wound. 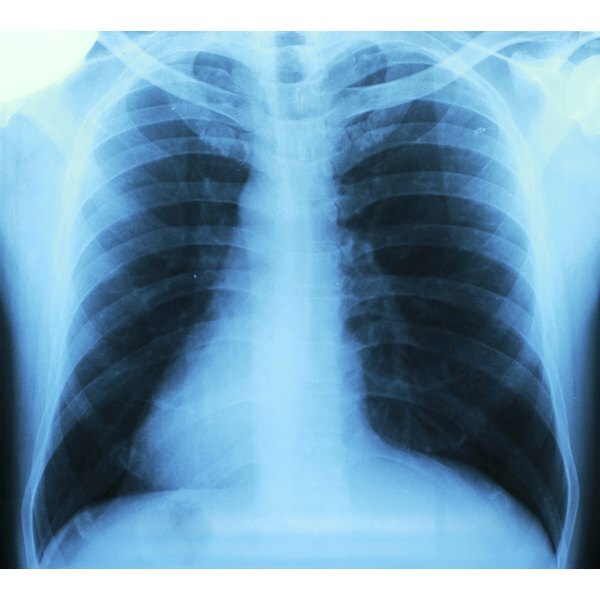 Pneumothorax can also be caused when the air entering the lungs is at a higher pressure than atmospheric pressure; this type is called tension pneumothorax and normally occurs due to diving or mountain-climbing accidents. The Mayo Clinic notes that more common causes of pneumothorax include diseases such as tuberculosis, pneumonia, lung cancer, tuberculosis and disorders due to cigarette smoking. Smoking causes almost all cases of primary lung cancers, which are those that originate in the lungs and are not spread from elsewhere in the body, as noted by the University of Maryland Medical Center. Lung cancer can cause severe pain in the chest as the masses of cancer cells press against the chest wall and other organs. This pain may be acute or chronic and general or localized. Treatment includes removal of the lobe that the cancer has affected, chemotherapy treatment and radiotherapy treatment. What Is the Difference Between Cardiomegaly & Cardiomyopathy?